Epidemiology is the study of the distribution of health problems and their determinants in human populations. In this context, one of its aims is to study the impact of behavioral, occupational and environmental factors on health. An epidemiological study aims to analyze the factors which influence the frequency or distribution of diseases and other health phenomena in the populations exposed to these factors. Its objective is to attempt to establish an association between exposure to certain substances and the occurrence of disease. There are two main types of epidemiology studies, experimental and non-experimental. The non-experimental studies are also called observational studies. The figure below displays the number of influenza-like illness (ILI) cases reported during the 2006-07, 2007-08, 2008-2009 and 2009-2010 influenza seasons. ILI is defined as fever > 100˚ F AND cough and/ or sore throat without another identified cause. ILI can be caused by a variety of respiratory viruses, so data should always be interpreted in the context of laboratory data. ILI cases are reported by physicians to local health departments. Local health departments report the data weekly to the state. The Centers for Disease Control and Prevention compiles weekly data and reports the data by “MMWR week.” Usually, there are 52 MMWR weeks per year. Some years, there are 53 MMWR weeks. By following this link you can read something more about descriptive and analytic epidemiology. The Sentinel map shows West Virginia counties that have enrolled influenza sentinel providers for the 2009-10 season. 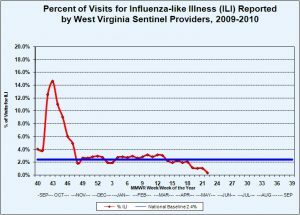 The figure below demonstrates the percent of visits for influenza-like illness (ILI) reported by West Virginia sentinel providers during the 2009-10 influenza season. Sentinel providers are volunteer physicians who report cases of ILI as a proportion of total patients seen. If the resulting percentage of visits due to ILI is higher than 2.4% then high rates of influenza transmission are likely. Reports of ILI should always be viewed within the context of laboratory data and other indicators of influenza activity. This graph shows the number of positive tests for influenza by type (A or B) as reported by hospital and referral laboratories that test by any of the following methods: polymerase chain reaction (PCR), immunofluorescence (IFA or DFA), or culture. Rapid test results are not included in the totals because of the low positive predictive value during times of low influenza activity. This graph is useful for assessing changes in influenza activity and type of circulating viruses. This information, together with information on influenza A subtype can be useful in guiding empiric therapy for influenza-like illness. 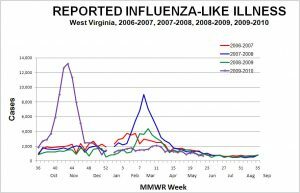 This graph is also useful for pinpointing the first identification of influenza in the state of West Virginia. 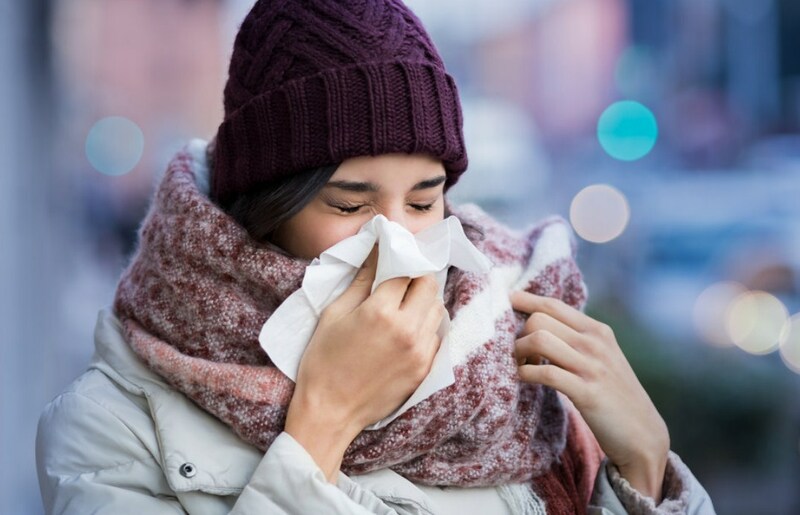 During a typical influenza season, positive identifications by laboratories usually precede the seasonal increase in influenza-like illness by many weeks. The left-hand Y-axis gives the total specimens isolated by these laboratories; and the right-hand Y axis gives the reported cases of influenza-like illness. 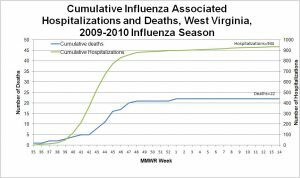 West Virginia is participating in the Centers for Disease Control and Prevention (CDC) national surveillance system for hospitalizations and deaths from influenza. On a weekly basis, hospitals in the state report hospitalizations and deaths in assocation witih laboratory confirmed influenza. Laboratory confirmation includes polymerase chain reaction (PCR), immunofluorescence (IFA or DFA), culture or rapid influenza tests. All laboratory tests for influenza, regardless of type or subtype, are included in this surveillance. Influenza deaths outside the hospital reported through death certificates occurring are also included if they are laboratory confirmed. Because not all influenza hospitalizations and deaths are confirmed by laboratory testing, these numbers likely under represent hospitalizations and deaths associated with influenza. Regional:Outbreaks of influenza or increases in ILI and recent laboratory confirmed influenza in at least two but less than half the regions of the state with recent laboratory evidence of influenza in those regions. Widespread:Outbreaks of influenza or increases in ILI cases and recent laboratory-confirmed influenza in at least half the regions of the state with recent laboratory evidence of influenza in the state.